- the true turnout was likely somewhere between 25 to 27 million people. 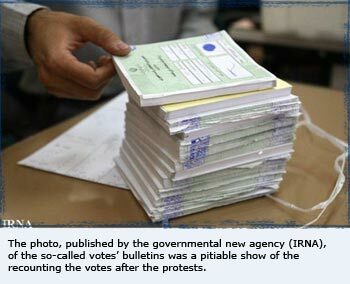 - From this figure some 11 to 14 million likely voted for Mir Houssein Mousavi. - This number includes the Iranians who are classified, according to sociological categorization, as middle-class. - This figure also includes greater Tehran and some other big cities like Isfahan, Tabriz, Shiraz, and Mashhad. - Ahmadinejad likely received some 8 to 10 million votes. - This latter figure generally contains peasants, pious/religious people, the inhabitants of small and medium cities and those who are financially attached to the apparatus. - The great absence in this election represents a figure of more than 15 millions voters who would have been essentially the poor social class. - The riots after the announcement of the election results were due to the huge gap between what the middle-class had imagined about the advantage of Mousavis’ votes in the urban areas and the announced figures. Some observers have stated that counting 30 million votes in 3 hours can only be a miracle. Now, the question is whether this false miracle had really been planned or not. A few facts relating to the pre-electoral climate show that the regime knew what it was going to do; several security exercises were pre-organized, the swift presence of thousands of security forces in the streets just the day before the election, the setting up of several anti-riots maneuvers just before the electoral period and so forth and so on. All these facts show that the ruling faction, dominated by the Revolutionary Guards (RG) knew that what it wanted to accomplish was a risky move. If the fraud was planned, we should examine its roots. On this subject we should first be reminded of the mismanagements by Ahmadnejad that pushed the country towards a catastrophe. According to a great number of people, the military style management had put the country in the worst economic, political, social and cultural situation than ever in the past. Meanwhile, we should not forget the influence of the global crisis and the worldwide plunge of the oil prices on the Iranian economy. This fact reduced the amount of the sharable income between all the mafias, bands and the internal factions of the regime and became a tension-making element. The increasing power struggle had been rooted in the high conflict of financial interests and the murky outlook of the future of the system. If we look back to the past we can underline that what concretely pressed this struggle of power to its climax was the entrance of the Revolutionary Guards (“RG”) on the economic stage after the end of the Iran-Iraq war in 1988. The RG were backed by the Supreme guide (Ali Khamenehi). The nuclear issue gave them a supplementary strategic role and under Khatami (1997-2005) as the right faction of the regime (Bazaar and Khamenehi) felt the danger of reformism, it increasingly used the RG to surpass the reformists, the moderates (Rafsanjani) and those who wished an opening in the economy. The entry of the RG in politics began with municipal elections where they took control of City Hall in Tehran, and then went on to win elections in the majority of parliament and finally took the presidency in 2004. At present the RG stand as the most powerful institution in economic, political and military fields in the country and are trying to expand their influence beyond the boundaries of law into the cultural and social fields that are still a bit out of their total control. The struggle of power in the summit of the structure was for getting or holding more shares in the economic and political fields and the hard reaction of society to Ahamadinejad’s government was for keeping the least independence in the cultural and social fields. Meanwhile, the RG consider the prolongation of Ahmadinejad’s job for four more years as necessary to take control of the totality of the power structure and to complete the work in the economic, political and particularly social and cultural arenas. 1) Group or society might not be able to predict or make a mistake in predicting the issues and to define the events before it occurs. 2) Once the event occurs, the group is not able to understand and have knowledge of the difficulty of the problem. 3) After having understood or knowing the problem, the group cannot find a way out. 4) The group makes lots of efforts but cannot succeed. Let us examine the first case to see if the ruling faction had made a mistake or not in the prediction of the reaction of society to its fraudulent plan. We have already stated that the strategy of the reinstatement of Ahmadinejad to his position had to be realized, as decided, by the triangle of RG, Supreme Guide and the Bazaar. To do so, the ruling faction wanted, on the one hand, to announce Ahmadinejad as the winner and on the other hand, to boost the election. The thinkers of the regime could not see the contradiction of these two ambitions, maybe because they were not aware of the extent of the public dissatisfaction as well as the hatred of the people towards Ahmadinejad. With the knowledge we have now on the ruling spirit of the military management style, the government should have predicted that promoting the election would be an ephemeral, relative and short-living issue and would not last more than a few days. As for announcing the victory of Ahamdinejad they supposed that they would face some minor but controllable reactions. Therefore, they based their predictions on the idea that they would easily handle the little protesting mobs. But how did it effectively happen? And why? To answer to this question we need to examine what caused the ruling faction to be wrong in its calculations. It is obvious that it would have been impossible to perpetrate their plan of fraud if the election had been subject to an unprecedented boycott by the voters; it was then necessary to hype up the elections’ ambiance. That is why two factors came about: the first one was the debates between the candidates and the second one, the relative tolerance of the government’s agents in the last days and nights of the assemblies of the young people and supporters of the candidates in the streets. These two factors generated an atmosphere in which there were positive and negative effects for the government: on the one hand, the debates and speeches between the candidates led to many subjects usually not discussed openly and taboos were broken, which represented a kind of settling of scores between the factions. For the first time revelations about corruption by those who governed the country during the last thirty years was discussed. This fact gave the Iranian people the unprecedented feeling that they stood in an important position and could look over the government’s function and have a determinative role over these issues. On the other hand, the relative governmental easing up during these days created the feeling that with their presence on the stage, people can enjoy freedom and its benefactions. These two facts, these two pure and rare feelings, generated a kind of social dynamism and a spirit of active participation for the determination of their own fate. Mir Houssein Mousavi had been welcomed, undoubtedly not because of who he was, since after 20 years of recoil, society and particularly the youth did not know him at all; but he took a high importance for the simple reason that any other person in that position would have been welcome with the same popular enthusiasm. But, did the ruling faction’s calculations work? It seems that their calculations were not in accord with what actually happened. The nervous reaction of the authorities; their haste to announce the results that had many obvious statistical errors; numerous reports on the election’s irregularities; insufficiency of the repression forces during the first week of the protests; the necessity of the intervention of the Supreme Guide, (Khamenehei), first to publish a statement approving the announced results and then in the Friday Prayer declaring a confrontation and finally the pathetic and catastrophic show of the recounting of “10% of the votes” in front of the cameras, are all proof that the ruling faction had very much miscalculated the risks and complicatedness in their plan. What was missing in their plan that made it so problematic? Based on what happened after the announcement of the fraudulent results of the presidential election, we can assume that the ruling party had not been able to forecast the difficulty and define the problem before it was produced. This means that their plan had been based on a few guesses and ideas that had been refuted by the events of post 13th July 2009 (the day after the election’s day). It appears that these miscalculations had been based on the fear and the passivity of the people in the pre-election period, but the electoral time and specially its last three weeks with the debates and the relative freedom in the streets, had such a quality and such an influence that it had considerably increased the potential of participation and the taking of risks by the people. In other words, the people of the pre- and post-election period were not the same. The presence of a gross number of people in the protests after June 12th and their standing up proved that they were not people who, per the imagination of the ruling group and their security estimates, stayed quite once the false results of the election had been announced. Therefore, in accordance with the above mentioned theory of management, we can say that what is obvious in the miscalculation of the regime was “their inability in updating the prediction of the difficulty and defining the problem before it happens”. On why this ability had been absent in the ruling faction we must talk about the brain-drain and the mismanagement of Ahmadinejad’s ruling group in the power structure, to such an extent that this animosity towards knowledge had spread into the government itself and gave decision-making power to those who, because of their lack of knowledge and specialty, had not been able to foresee the problem that would come from the election, nor to guess exactly the dimensions of the protests. How the people took advantage of this opportunity? - this insurrection had been set up in Tehran and some other big cities and essentially by the middle class. - The students and educated people were the main actors of this movement. - The geographical field of the protests in Tehran and other big cities was mainly in the neighborhoods inhabited by the middle class who knew every corner. - We could imagine that as these social categories had been relatively materially satisfied, then they could pay attention to the non-material issues. - This latter point represents the social consciousness of the middle class in Iranian society. - The content of this consciousness is such that it includes the issues covering all society like human rights, democracy, freedom of speech and so forth. - While within the poor class, because of the cultural poverty, the high material poverty and the psychological and social deconstruction, their existing consciousness has got less extension and is concentrated on the concrete material claims related to its livelihood. - A precise example of the cultural differences between these classes can be seen in the worldwide reflect of the movement; this comes from the large usage of the new technology and communication’s tools by the member of the middle-class layers. - This movement however is rooted in a wide dissatisfaction of almost all the social layers of Iranian society, except those who benefit directly from the current regime’s survival. - At the beginning of the movement the slogans and the claims of its actors were more political, cultural and social and less economic. - It seems that the lower classes did not see themselves and their aspirations in this movement and then did not really attend to it; at least at the beginning. - The geographical limitation and the restriction of the concerns of the movement did not create an appropriate field to make the other social classes come into the movement. - These three limitations caused the repression’s machine could better concentrate all its forces on a limited part of the population and a limited geographical field in order to make it backtrack. - Therefore the reason for the success of the repression was in their proportional superiority regarding the quantity of the protesters. - The quantitative parameter is related to the number of protesters and the geographical level of the protests as well as to the extent of the organization of the protesters, the absence of effective leadership and the lack of radicalism in the movement. Now the main question is whether repression can solve the problem. In other words, does the government reduce the risk or make the risk disappear? If we look only at the outside appearance it seems that the problem has been reduced, which means there is no imminent danger for the regime. The regime understood that it had made a mistake about the extent and seriousness of the protests; then it reacted aggressively and intensified the power of repression till it could reduce the amount of protests and people’s gatherings. But does the reduction of the numbers of protesters mean the resolution of the issue? Did the movement that rose up after the cheating in the election have only one dimension, the street protests? 1) The gap in the homogenous structure of power: the Islamic Republic, despite its internal differences, had acted more or less united during the three last decades. No faction had in actuality denied the other one; they stayed in a more or less implicit level of disapproval and criticism, trying to get more shares. But it seems that the deep roots of struggle for power and wealth that emerged during these last elections, has definitively undermined this homogeneity and opposed the factions against each other, as “enemies”. There are a few factions within the State that are looking for an opportunity to take the other one out. This is the first step in the path of elimination that can go towards physical suppression and bring with itself the fallouts that make the situation more critical. At present, the regime has to decide what to do about those who have been arrested during the movement, especially the known political figures. It can either release them (and this will be seen as taking a step back since these people would become critical again, encouraging the people to rise up against the ruling faction) or it can not look back in which case radicalism will develop among the reformist elements and the gap will eventually turn into a confrontation. Would the reformist realize that the radicalism might be the only way to assure their survival? 2) The ideological and religious gap: in this frame, the different approaches of the clerics on the Velayat Faghih (the religious Jurisprudence) and the Islamic government and the manner the government treats the people have been subject to disarray. The regime has a certain history with religion and has not yet enough force to incite an open struggle against the religious personalities. But the diversity of religious views breaks the image of a homogenous regime within the ideological body of the system and becomes a ground for the views that can only intensify the tension on the political stage. We can remind the statements of Montazeri and Saaneei that could eventually lead to an operational radicalism of their fellows. In the shadow of this crisis the main goal of the Islamic Republic – remove the contradiction between the State and the Mosque (clergy) – will be questioned and maybe, once again, as in the pre-revolutionary period, the State and the Mosque would become separated and even two opposed institutions. This process that has just started will break the ideological homogeneity of the system and will bring with itself two categories of ruling clergy and no-ruling clergy. 3) The social legitimacy crisis: the election has revealed corruption, criminality and lies embodied in the ruling party in a clear manner for the Iranian people. This image has not been suggested by the enemies of the Islamic Republic, but shown by those who are within the system. Following this, the movement took apart an important part of society from the government, not as an implicit fact but as an explicit reality. This makes us understand that the government cannot hope any longer in having the obedience of the people as a natural and voluntary act of individuals; on the contrary, it must overuse fear, weapons and threats. The recent statement of the judiciary authority announcing the usage of satellites as a “crime” shows their conception of controlling social life. We know that no social order can persist without the voluntary compliance of its citizens. The ruling order – like those of Chile, South-Africa and Turkey on their dictatorial system – is just a provisional order and a ground for intensifying future disorder. The relationships of citizens with the regime are hence more based on tension and separation and will feed the fire of the struggles that can, at any moment, be sparked. The separation of society from the government will be crystallized in the daily life of the people. A government without legitimacy, that wants to last with fear and threats will have a short life. Especially when it has lost opportunities to reconstruct its legitimacy. 4) The foreign legitimacy crisis: the image of the Islamic Republic during this movement has been damaged as much as during the past twenty-nine years. It went from a regime that seemed controlling the situation inside the country and had a more or less acceptable image in some Islamic countries to suddenly a criminal, tied to a Coup d’État and hated by its people. This degradation will surely impose a high price in diverse fields for the current government and its fallouts will show themselves here and there. Reduction of the level of the diplomatic relations, serious troubles in nuclear issues negotiations, isolation of the government’s figures, lack of official recognition of Ahmadinejad, interruption of past negotiations, non-invitation of government officials in international assemblies, non-issuance of visas for the regime’s authorities, the undermining of economic and political agreements and lack of international attention regarding the official and non-official statements of the regime are some examples of this case. 5) Economic crisis: the movement had slowed the wheels of the country's economy and if the tension remains alive, it can put them off. The losses of the stock market and of the telecommunication, the paralysis of the tourism and the crisis in the small trade are some other cases. But, all of these issues are only an appearance. The high unemployment in the future months, the decrease of the government’s incomes, the increase of its spending and the absence of foreign investments are going to impose a kind of general paralysis to the economy. This is a few examples of sides effects that, if develops itself, will become the main cost of the repressive behavior of the rulers and will bring with itself more social and economic protests, in such a way that the subject of the election can be put aside because of the probable unrests of the dissatisfied, hungry and unemployed or unpaid people. With a review of these five crisis that we counted as an example we can understand that the decision of the ruling faction had been, regarding its outcomes, a quite unsuccessful issue. Because the objective of the Revolutionary Guards had been to complete invading of all the fields of society thanks to buying four more years for Ahmadinejad, in order to get over the control of all the country. Their main aim is to reach probably the atomic bomb and to become a power that no one can challenge, neither the people of Iran inside, nor any other foreign State outside. Something similar to the North Korea but an Islamic one. In this case, the objective would be the installation of the caliphate system of government and the progressive suppression of the elections: founding a hereditary of the statute of Velayat Fagigh and a permanent statute of the presidency can be parts of this plan. But the above five crisis show that the current situation is far from allowing these latter dreams of the extremists to be accomplished. Particularly if the masses of people, as the main engine of the movement, can find the way to reactivate it. We will now look into this subject. What is the current situation of the popular movement? What is its future? 2) the preparation of the common offensive actions in order to push the ruling faction back and get a final success. It seems that as soon as one of these two sides (the people or these reformist figures) unhands the other one, the regime will attack them both. Therefore, now there is a relative invisible protection because of being side by side. But these fragile conditions can turn into their disadvantage if an important popular anti-establishment action is not taken. This means that the ruling faction intensifies the pressure till one of them leaves the other one and then it would start the repression and the suppression of both of them. But the continuation of the repression until the separation and breaking both would although be possible if the ruling faction can, as it neutralizes the main actors of the movement, pay the high price of the repression. Then if the costs of the repressive policy of the State arise, at a given point the government can not more put the pressure on the main core of the movement or only in a very limited. If the unity of opponents’ front keeps on we would see a more brutal attack of the regime, but no one expects any victory of this latter. In this case we have to see if with the beginning of the attack, side effects for the government will increase or not. If the secondary costs are increased before the new attacks start, it will undoubtedly time for the government to walk back and to give up. And the next backward in the weakened conditions by the government will be the starting point of going towards its fallout. On the other hand, when the people start an offensive action if the pressure of the side effects is not high enough, the ruling faction can reconstruct itself and carry a new attack out. Therefore it is necessary that in both the current situation and the future situation, the intensity of the pressure of the five above crisis remains very high. This is the only way to get success as well for now as for the future. By maintaining the pressure high we means that all the actions that are not directly related to the protests and its repression should be enhanced: 1) paralyzing the economy by strikes and sittings; 2) preventing the establishment of the ordinary economic and diplomatic relations with the world; 3) denunciation of the regime in any international occasion; 4) make difficult the ordinary function of governing in all macro and micro fields; 5) civil disobedience and making the government exhausted. Six months after its starting, thanks to these kind of activities, the movement that is going on can create a qualitative change by which it can reach its goal. The future will show who had won this unequal war, a repressive regime that takes advantage of the billions of oil incomes or a society that wants its freedom, “ by any means necessary”. The ideological army that had been created after the revolution of 1979 as a parallel with the classic Iranian army. R.K. JAMES, Crisis Intervention Strategies, Brooks Cole; 6th edition (July 27, 2007). He did not have any important political presence after he left his position of prim minister in 1988. Both of them are the Grand Ayatollahs. They stated the aggressive government’s behavior has been in contradiction with the religious precepts. Which was the main thesis of Khomeini. Taken from the famous speech of Malkom X.
Licenza di tipo: Attribution - Non Commercial - Share Alike 3.0. Resta ferma la possibilità di adottare licenze più restrittive. Le sezioni della rivista vengono aggiornate con cadenza semestrale.